Home > digital-audio-lab, e-languages, Glitches&Errors	> How to work around a possible bug of Sanako Study 1200 collecting student files opening multiple explorer windows? 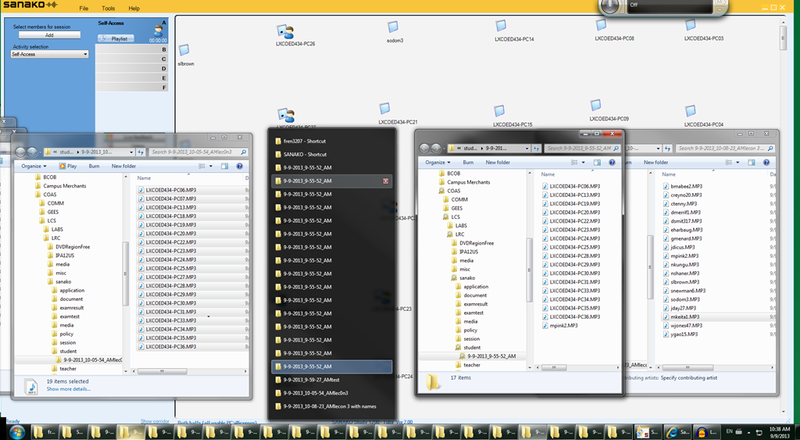 How to work around a possible bug of Sanako Study 1200 collecting student files opening multiple explorer windows? while other are displayed under their login name? This is aggravated by another limitation (or bug): Students that come online after I chose show student computer names, are not affected by this setting, but display with their login name (the default). Make sure all students display under the same naming scheme. This is best achieved by waiting until every student icon shows up in the classroom map before changing the classroom map student display option.